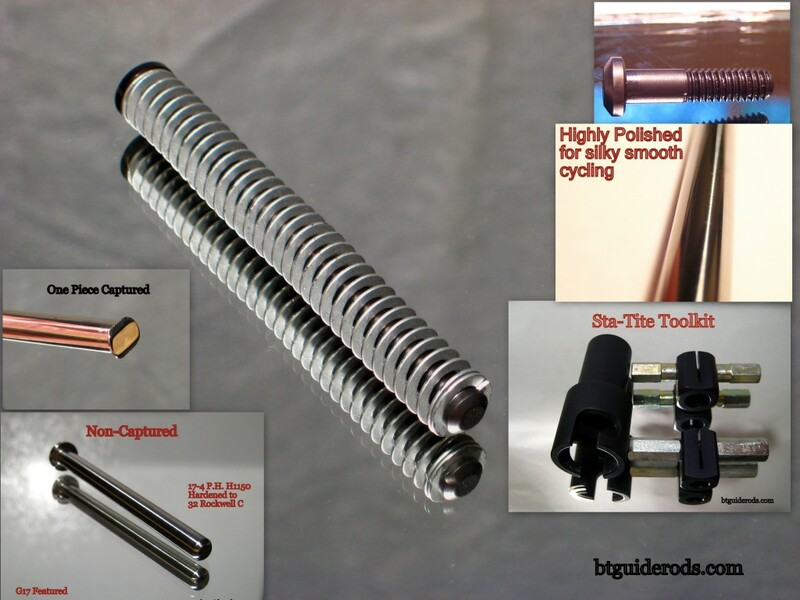 Above… a collage of representative products manufactured by BT Guide Rods. Products designed to improve reliability, function and perceived recoil. Specializing in Captured Guide Rods, BT Guide Rods strives to maintain the firearm designer’s intent when crafting a replacement guide rod in order to maintain the reliability of the pistol. Offering two series of captured guide rods: the two-piece STA-TITE Series and the ONE PIECE captured series, all BT Guide Rods have been conceived with reliability in mind, designed to be an absolute improvement over the stock part and precisely manufactured to exacting specifications to ensure your satisfaction. Read about the various designs offered and check the availability for your pistol by clicking on the model(s) at left. Don’t see what you’re looking for? Shoot an email to: [email protected] and someone will reply promptly.